Yesterday, responding to rocket attacks on Sderot, Israeli Army launched almost a dozen air strikes killing 20 Palestinians. The dead include members of the rocket squads who are shooting the Qassam Missiles into Sderot and Ashkelon. The dead also include 5 children between 8 and 12 years who were playing soccer. There would have been a world wide condemnation if this has happened in any western country but since this has happened in Palestine, who cares !! Till how many more years Palestinians have to suffer like this. While one person died due to the rockets from Hamas, Israel killed 31 Palestinians including 14 civilians, among them 8 children. I do understand the problems these Qassam Rockets create but how effective are these rockets ? Our of 50 rockets, one rocket would hit the target causing injuries or at the maximum a casualty. Compare that to Israel's heat seeking missiles, multiple barrel rocket launchers, most advanced Tanks, Fighter Planes like the US built F-16's, Apache Helicopters, Drones and not to forget the spy satellites. Israel also attacked democratically elected Hamas Prime Minister, Ismail Haniyeh. The US says it supports democracy but why are they keeping quiet when Israel has attacked the personal office democratically elected Prime Minister of Palestine ? Israel lost the previous war with Hamas when Hamas snatched two Israeli soldiers from the border. Israel could able to only hit civilian targets like buildings killing innocent people and Israel, with all its high end weaponry was targeting infrastructure like bridges and electric stations. With electricity gone (check my previous post on Collective Punishment By Israel, it effected emergency health services. Israel should understand that it is achieving nothing except create more militants by targeting civilians. It has to start building Confidence Building Measures for a peaceful future before Hamas lays its hands on more sophisticated weaponry from Iran or Syria. It is learned that during the recent border breach with Egypt, Hamas militants have smuggled in Iran's long range Grad Missiles. Looks like options are narrowing down for Israel before world forces it to make peace. End Of Road For Musharaff ?? The way things are going on, I dont think this is the end of Pakistan President, Mr. Parvez Musharaff. While every newspaper and media channel is shouting from the roof tops that Musharaff is given a drubbing defeat, the reality is that he is "almost" in the same position with a verdict divided among parties and giving no one a clear majority. 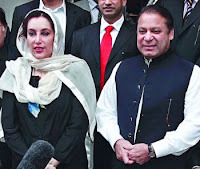 The assassinated Benazir Bhutto's Pakistan People's Party (PPP) got the highest number of seats - 90 out of 270, surprisingly Pakistan Muslim League (PML-N)under former Prime Minister, Nawaz Sharif did well and settled for 70 seats. The Kings Party, PML-Q got around 40 seats while Muttahida Quami Movement (MQM) of the self-exiled leader, Altaf Hussain got around 20 seats. North West Frontier Province based Awami National Party (ANP) got around 10 seats. Surprisingly, along with PML-Q, the major losers are the Islamic parties like MMA. Pakistanis gave a splintered verdict because of which Musharaff cannot be impeached as it requires a 2/3 votes in the National Assembly to impeach him. And, no party is in a position to put it into practice. But, chances of the powers of Musharaff been curtailed are there. Even though not a politician himself, wily Musharaff knows ways to stay in power as he has been proving for the past 5 years. He had sent delegations to PPP Vice-Chariman, Asif Ali Zardari (Benazir's son, Bilawal Bhutto Zardari is formally made as Chariman of the PPP) not to team up with Nawaz Sharif. 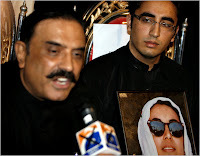 Zardari has not given any commitment but it has to be noted that Benazir Bhutto and Zardari have come back to Pakistan after a commitment from Musharaff that their cases would not be re-opened. Zardari is meeting Nawaz Sharif tomorrow to sort out the modalities of formation of a coalition government. The next one week would change the face of politics in Pakistan. It would be for the good of everyone that Pakistan would be back to normalcy and grab the democratic opportunity it has got. Media and Intelligence reports suggest that US is planning for a pre-emptive strike on Iran's nuclear facilities. But, how much feasible is anyone's guess taking into consideration the vast land mass Iran consists of and the secrecy in which it maintains its nuclear and other military facilities. But a question arises - Why cannot Iran have a Nuclear Weapon when countries like India, Israel and Pakistan who have not signed the Nuclear Non-Proliferation Treaty (NPT) have ?? Pakistan has given a completely new meaning to Proliferation as it manages a huge Nuclear industry supplying nuclear material to countries like North Korea and Iran clandestinely through its infamous Nuclear Scientist, A.Q. Khan. Countries who have nuclear capabilities have either openly or clandestinely been transferring nuclear technology to its friendly countries. So, NPT has lost its meaning - the main reason why India didn't sign it. Coming to the main issue - when a country like Israel, which is just around 500KM from end to end can possess a nuclear weapon, why cannot Iran ?? Israel is been actively aided by US in its pursuit for nuclear and other military hardware. Now, Israel is in a position to export military hardware to countries like India. Incidentally, Israel occupies second position with regard to military imports by India, just after Russia, India's closest friend since the cold war years. If US or Israel attacks Iran, it would lead to wide spread protests from many countries - including India. Majority of India's oil imports come from Iran and when the economy is on a high, India cannot risk losing it's vital input for driving its economy. On September 6th,Israeli jets attacked Syria and destroyed a building. There is no official word on the incident from Israel and Syria also retaliated with very mild protests. So, what did Israel bombed ?? Analysts say that it might be a nuclear facility which is in its initial stages of construction or either a Chemical Bomb related facility. Syria concluded that it is an un-used military facility. Israel had sent a message to Iran through the bombing that it would not let any country in its periphery which develops weapons that might lead to its destruction. How many more years should Israel live like this - attacking its neighbors, occupying their lands, living in danger and waiting for another suicide blast ?? Since Israel is the occupier, it has the responsibility to make peace with its neighbors. The only solution looks to me is a Free Palestine !! Because of this one reason, Muslims all over the world hate Israel and US. If this problem is solved, then there would be no hatred. Let us all give peace a chance ! Another instance which clearly shows that Sonia Gandhi has to learn Indian ways of living and giving respect. A group of Congress Leaders from Telangana Region led by Deputy Leader of Congress Party in the Lok Sabha and Congress Working Committe (CWC) Member, Mr.G.Venkata Swamy (Lok Sabha Member from Peddapalli Constituency in Karimnagar District of Andhra Pradesh) went to New Delhi to seek a meeting with Sonia Gandhi to put pressure on formation of separate state of Telangana. He is one of the most respected and oldest member of the Congress Party. He's been with the party for almost 50 years. He was accompanied by some of the most senior Congress Party members from Telangana region. The entire team met all the members of the Core Committee, including Prime Minister Manmohan Singh, which was setup to deliberate on the separate state demand. Sonia Gandhi refused to meet them inspite of the leaders waiting for a full 4 days for her "Darshan". These are elders of the party and they went to meet the party leader, instead of respecting them of their age and what they have done for the party for so many years, the "Leader" who is imported from Italy choose not to meet them. Basic courtesy should have been shown to the leaders. They should have been given audience and then should have told them that she would look into the demand. The gross disrespect she had shown only proved that she has scant regard towards the aspirations of the people. This disrespect is not to the Congress Party leaders - This is for the entire 35 Million people of Telangana region. It is time all the leaders of all the parties fighting for a separate state resign from their posts and launch an all out agitation. Telangana NOW if not, it would be NEVER !! Felt sad knowing that Sania Mirza has pulled out of Bangalore Open. Asia's top ranked and world's 29th ranked tennis player said that she is not in a right frame to play for the Bangalore Open where Sarena Williams is expected to play. Recent off-play controversies have been troubling her and at one point of time, she planned to quit playing the game itself. After a very long time, India has produced a very talented tennis player and people from Mullah's to the Nationalists are bent upon pulling her down. This is not good for the country of more than a Billion people. The Mullah's are already targeting her being a Muslim girl wearing skimpy clothes. Maybe, they are unaware that playing Tennis wearing a veil from head to toe is just impossible. Let them try once and then start giving lectures. 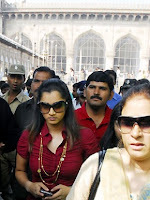 Other controversy being Sania Mirza appearing a commercial advertisement which was shot at the famous Mecca Masjid at her home town, Hyderabad. The Masjid Committee put up a case against her saying she did the ad without taking permission. These guys have to understand that it is the responsibility of the Ad company to take due permissions and not the actors themselves. Sania Mirza had to personally apologize in a paper statement. Another controversy been that she was photographed with her legs somewhere near the Indian Flag when she was playing for Hopman Cup in Australia. A guy from Bhopal filed a case against her for defaming the national flag. We need to understand that she is playing for the country and no Indian would defame the national flag. Sania Mirza is such a person that she would keep her personal fame at stake for the sake of the Nation. No one can dare question her Nationalistic feelings as she is one of a very few players who are playing for the sake of the country. I think it is time that the Mullah's and the Nationalists leave Sania and let her bring fame and good name to the country in the field of Tennis. Sania doesnt need the support of either the Mullah's or the Nationalists. She needs support from ordinary and original Indians - LIKE YOU AND ME !! GO SANIA GO - INDIA AND INDIANS ARE WITH YOU! !